A few of our authors have come together to share a variety of articles and items of interest on their blogs for your enjoyment. There are some lovely giveaway prizes, and – to stay in keeping with the Spring and rebirth theme at this time of year – some colourful Easter eggs. Feel free to collect the eggs, and use them where you like. They were drawn by SilverWood author Peter St John who writes the ‘Gang’ series about a boy who was evacuated to a village near Ipswich during WWII. 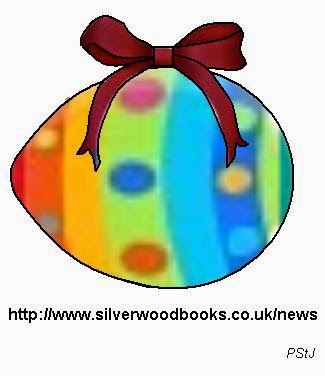 Meet Peter and his characters on the Blog Hop, along with a host of eggcellent SilverWood authors. “No woman ever launched a volume on the world without apologising for it first. ‘Took up my pen with no thought of publication... Nothing but the necessity to provide for a young family could have induced me to lay this trifle before the public... Beg the reader will look kindly upon it for all its demerits.’ ” (Chapter 5). Why did this detail matter to me? Sheridan’s preface to The Rivals is a long apology for the defects of an earlier draft of the play, which he says fully deserved criticism. Few writers, he adds, “do not wish to palliate the faults which they acknowledge” and “second their confession of its deficiencies, by whatever plea seems least disgraceful to their ability” – his plea is inexperience. Even so, Sheridan has enough confidence to refer to his “ability” and to defend his work from “little puny critics” who are “spleen-swoln”. William Godwin, in an introduction to the 1831 edition of St Leon, originally published in 1799, refers to the “diffidence” which kept him from attempting another novel after the publication of Caleb Williams in 1794. Evidently, he got over it. In his preface to Tom Jones, Henry Fielding asks the reader “that he will not expect to find perfection in this work;...and...that he will excuse some parts of it, if they fall short of that little merit which may appear in others”. At the same time, had he “been sensible of any great demerit in the work” he would not have sought patronage for it. Even when mocking the parade of false modesty, writers were rarely able to stray from it. In his memoirs, bookseller James Lackington, ostensibly rejecting the custom of pointing out his “weaknesses and imperfections”, self-deprecatingly would consider himself “amply rewarded” if the reader deems his memoir “not the worst” ever written. For all that, he claims there is merit in his work. It shows what can be achieved by “a persevering habit of industry, and an upright conscientious demeanour in trade”. Samuel Richardson’s own trumpet-blowing in Pamela – “he thinks any apology for it unnecessary” – seems almost refreshing by comparison. Almost. There was one thing the men never apologised for, and that was their gender. When a woman took up her pen she had to come up with a good excuse for trespassing on male territory. There was nothing frivolous about this, even if the excuses were often thin. A common one was the need to earn a living. Elizabeth Inchbald in A Simple Story says she was driven to write by “Necessity! – thou, who art the instigator of so many bad authors and actors”. Charlotte Smith in her preface to her radical novel Desmond referred to the “affairs of my family” which forced her to write for money (her estranged husband claimed her earnings, as he was legally entitled to do), and she also confronts the criticism that “women...have no business with politics”. The ultimate apology a woman could make was anonymity. Of course, many men published anonymously, for example to avoid prosecution, or to protect their professional status – Henry Fielding published some works anonymously because he was a magistrate. However, the male writer had only to hide his name, not his gender. Sarah Scott’s Millenium Hall was written by “A Gentleman on his Travels”. Frances Burney published her first novel Evelina in secret, sparking off an excited debate about whether the writer was a man or a woman. Revealing their gender was a serious undertaking for women writers. When Clara Reeve published a revised edition of The Old English Baron it was only after a great deal of persuasion and “with extreme reluctance” that she could “suffer my name to appear in the title page”. Sarah Fielding’s authorship of The Adventures of David Simple was only made known when the rumour got about that her brother Henry had written the book and he felt the need to defend himself from accusations of hypocrisy (he had vowed never to publish anonymously). The second edition revealed Sarah’s authorship, but it was Henry who wrote the preface which focuses on – Henry. However, the main reason the detail mattered to me is that women writers are still concealing their gender. J K Rowling published her Harry Potter books using initials on the advice of publishers who said boys would not read the books if they knew a woman wrote them. She went on to publish her detective novels under a man’s name (there’s a long tradition for this – the Brontes, George Eliot...). The use of initials by women authors is common in fantasy, science fiction and thrillers. Manda Scott changed to M C Scott because, she says, most men do not buy books by women. It’s harder for women to get their books reviewed too – in March 2013 a Guardian survey found that 8.7% of books reviewed in the London Review of Books were by women; 26.1% in the New Statesmen; and 34.1% in the Guardian. The figures are no better in America, as the VIDA project’s annual count shows. Historical fiction is as much about the present as the past. It reflects our own situation and preoccupations, and for me that’s what makes it relevant. It’s a way of asking: how much has changed? As Ben Dearlove’s remarks suggest, for women writers it sometimes seems not very much. There are six in all scattered throughout the Blog Hop. Collect them all and feel free to use them on your own Blog or Facebook – or wherever you like! Helen Hollick Let us Talk of Many Things Fictional Reality. Anna Belfrage Step inside... Is Freezing in a Garret a Prerequisite? Isabel Burt Friday Fruitfulness Flees for the Easter Hop.. Thank you for sharing this post! I really like this line, "The ultimate apology a woman could make was anonymity." Cripes, isn't that the truth! Great post, Lucienne. I'll be retweeting this one for a while to come. Thanks Helen! Glad you found it interesting. Loved your post, Lucienne. Is a reminder to me of what went on in my grandmother's, and especially, my great grandmother's day! Thank you for sharing. Thanks Caz, glad you enjoyed it, and of course sad that's it still happening. Thought-provoking and somewhat depressing. "Plus ca change" and all that. Will tweet! Thanks, Anna. Yes it is a tad depressing, especially when we all know that women's writing is just as good as the men's! An excellent point, Lucienne. I thought long and hard about whether to publish as A M Morton or Alison Morton and in the end plumped for my normal name. The 'this is who I am and this is what I've written - take it or leave it' approach. Gender expectations are still very entrenched. I have a number of Romantic Novelists' Association colleagues who are men, but almost all, if not all, write under a female pseudonym, e.g. Bill Spence/Jessica Blair. Hi Alison, yes I know many men write romance under female names, which is another sign of the way gender expectations work. I like your approach though! Thank you for your comment. That's a really interesting perspective on the issue of female anonymity, ie that it functions in the business world too. Leaving a quick comment Lucienne as I'm battling flu :-( this post looks so interesting, I'm calling back when I feel a bit better to devour it! Very interesting post about women disguising themselves as men in order to sell more books. I wonder if there any examples of books written by men under the guise of a woman! Figures it would be while writing Romance books! But that is interesting too. How sad that we stil have to pretend to be men in this day and age. But do women and men tend to write different things? Most (not all) of my favourite authors are women as it happens. But is this governed by the genres I prefer? Not romance, but contemporary women's fiction for the most part. The exceptions? McEwan is the first to spring to mind. Good to see more and more women authors - and characters - on the crime scene too. Lots to think about - stand by for a blog post! A. That's a very interesting question. I suppose that if women and men are writing, say, thrillers, or fantasy, they are writing the same kind of thing - at least to some extent? Perhaps women writers take a different angle...I look forward to your blog exploring this. I live in Bristol and I write historical fiction and non-fiction. In 2006 I completed an MA in English Literature with the Open University, specialising in eighteenth century literature. My historical novels are set in the eighteenth century. To date they are: To The Fair Land (2012); and the Dan Foster Mystery Series comprising Bloodie Bones (2015), The Fatal Coin (2017) and The Butcher’s Block (2017). Bloodie Bones was a winner of the Historical Novel Society Indie Award 2016 and a semi-finalist for the M M Bennetts Historical Fiction Award 2016. The Bristol Suffragettes (non-fiction), a history of the suffragette campaign in Bristol and the south west which includes a fold-out map and walk, was published in 2013.